'The benefit of teaching life skills is that I also changed. Unfortunately, due to sales rights restrictions, we cannot offer Stories from the Field for sale in your country. • After reading these stories, you will not merely see young boys or girls kicking a ball and appreciate the novel aesthetics, but you will smell the dust and know it is a family and community at play. 'The benefit of teaching life skills is that I also changed. If I can make a difference in the life of just one child, I will be happy' When we think about Africa, we often recall pictures of a wild countryside, rivers, forests, deserts, buzzing markets and media stories of poverty, devastation and hunger - a prime continent where branches of human justice are still thin and often absent. Those of us who have made Africa our destination are witness to a different experience as we meet people who charter a life of resilience and construct a social world of their own. Extended family ties stretch far and deep and so do family feuds, political turmoil and the many manifestations of poverty - painting a human canvas on which development programmes (including sport-for-development) need to blend in strokes for reciprocal change. The GIZ/YDF programme is possibly one of the most significant programmes in terms of philosophy, methodology and scope that sheds light on development work as it is embraced, transformed and assimilated into real-life experiences. 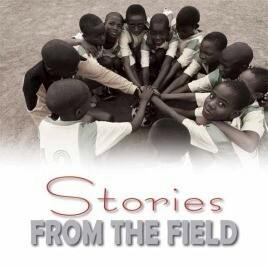 It is at this embedded level of social uptake that the selected 15 stories in the text and the detailed 45 stories on the CD articulate real-life experiences as told by programme participants, peer- educators and YDF partners who took up the responsibility and challenge to change lives for the better. Multiple voices give an expression to the meaning and dynamics of sports-related interventions as they affect individuals within a myriad of social relationships and contexts. The uniqueness of this publication is that it not only captures all these voices to constitute stories from nine African countries, but validates a ripple of impact where context is a prism for seeing and knowing. How do real people see and benefit from a sport-for-development programme? How does the North meet the South in partnership and trust? After reading these stories, you will not merely see young boys or girls kicking a ball and appreciate the novel aesthetics, but you will smell the dust and know it is a family and community at play. You will realise that aspirations and expectations are born from a need for entitlement in a field where the pitch is only the beginning of a journey. May this brief encounter do justice to all who shared their lives with such honesty and hope.